We welcome and encourage diversity in our membership and leadership. We respect, understand and appreciate the individual differences among us. We recognize and appreciate that differences bring to OADC varied perspectives, backgrounds, experiences, talents and interests. 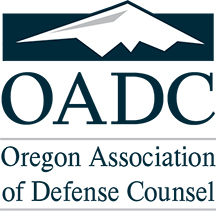 Our diversity greatly enhances our ability to carry out OADC’s core mission of defending the interests of individuals and businesses in civil litigation.